Kneipp Lavender Balancing Mineral Bath Salt is made with a high content of pure and natural thermal brine salt and valuable lavender essential oil. Activated by hot water, these enriched salt crystals help build resistance to daily demands, help to exfoliate, tone and increase elasticity. 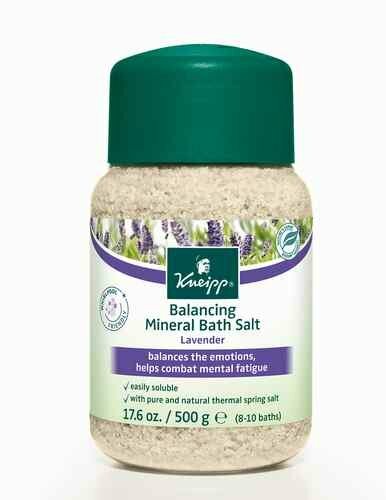 Kneipp Lavender Balancing Mineral Bath Salt helps keep you grounded when life gets too hectic. For a full bath, add the bath crystals to warm bath water (approx. 97-100F/36-38C) and dissolve them completely. For optimal enjoyment soak for 15-20 minutes. SODIUM CHLORIDE, POLYSORBATE 20, LINALOOL, PARFUM (FRAGRANCE), LAVANDULA HYBRIDA OIL, CAMPHOR, LIMONENE, SODIUM CARBONATE, SODIUM METHYL OLEOYL TAURATE. Kneipp Lavender Balancing Mineral Bath Salt Crystals work miracles not only on my body but on my soul, so to say. They smell of lavender (not a chemical scent, but a more natural one), and help to ease up tension. Around 15 minutes in a hot bath with a handful of the crystals and a healthy blissful sleep is guaranteed. I also use these crystals for improving the condition of my nails on hands and feet - making a small 'baths' in a tub. For best results I recommend taking such baths once in 2 - 3 weeks.